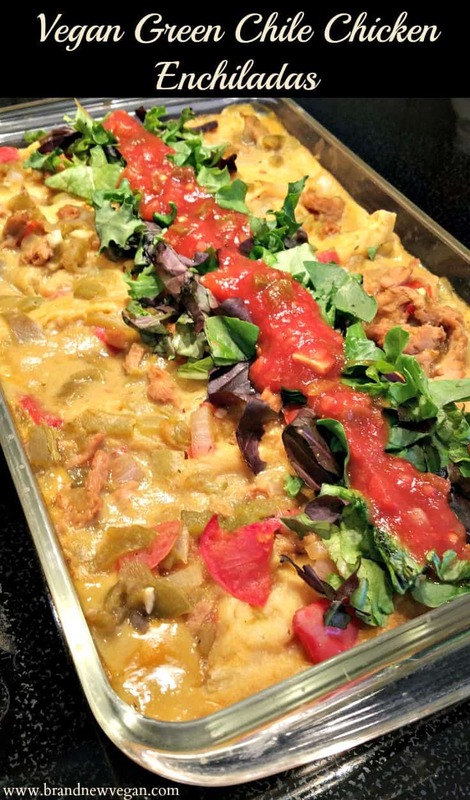 This Green Chile Chicken Enchiladas dish has been a long time coming. It was easily one of my family’s favorite dishes back in New Mexico – especially this time of year when the first batch of Hatch Green Chiles would appear in the stores. But since becoming Vegan, it has sadly been forgotten in our kitchen. We no longer eat cheese, or sour cream, or chicken – so into the archives it went….. I popped into our local Whole Foods one weekend and saw that the first batch of Green Chiles had made it in. Yay Green Chiles! Ask any New Mexican what makes his or her state so special and I guarantee it will always be the Chile. Their spicy Green or Red sauce is put on everything from tacos and burritos to hamburgers and pizza. And this time of year the chile roasters are on every street corner – wafting that incredible smell of roasting chiles into the air. But as I was picking up that first package of Chiles, I happen to walk down the aisle and noticed this package also…..
Now I’ve been hearing about these things, and knew that soy curls were the ‘in thing’ in the vegan world, I had just never seen them before. I mean what in the heck were they? What made them so popular? Why was everyone ranting and raving over these things? And then I read the back of the package. Wow, these actually look pretty healthy. But what do you do with them? Well let me tell you – pour in some hot water to let them rehydrate – and magic happens. I kid you not – they look and have the exact same texture as shredded chicken! And right then and there, with my Green Chiles already in hand, I knew EXACTLY what I was going to do with them. You’re going to need some Sour Cream for this recipe. Either buy your favorite Vegan Sour Cream – or make your own. I have a very easy recipe for Vegan Sour Cream right here. You’re also going to need some cheese – so again you can add your favorite Vegan Cheese Shreds or you can easily make your own healthy cheese with my Amazing Vegan Cheese Sauce Recipe. Start by adding 2 cups of hot water to 2 cups of soy curls. I added a few tablespoons of soy sauce to my water along with some typical chicken seasoning like thyme, garlic powder, and sage, just to add some flavor. Let them sit and soak while we prepare the sauce. Saute 2-3 cloves of garlic and 1/2 an onion in a little veggie broth until softened. Whisk 3 Tbls of flour into 1 cup of veggie broth and pour that in with your onions, it will start to thicken immediately. Add 2 more cups of veggie broth and your chile. and stir to combine. If you cannot find fresh Hatch Green Chile – those little 4oz cans of green chile you see in the grocery stores will work. The flavor is not quite as intense, and the spice factor will be next to 0, but it’s still green chile. I would use 3 to 4 of those little cans and adjust from there. Some fresh jalapeño would also add some heat if you like your enchiladas spicy. If you DO have fresh Hatch Green Chile, start with about 7-8 chopped chiles and adjust from there depending on how spicy you want it. Now drain your soy curls (chicken) thoroughly, squeezing as much water out as you can and add to your broth. I also like some tomato in my sauce, but this is entirely optional. I just happened to have a couple sitting on my counter so I threw them in. Once the sauce has cooked down a bit, drain the ‘meat’ and veggies, but save the liquid. To assemble the enchiladas, pour a little of that liquid we saved into the bottom of a casserole dish, enough to cover the bottom. Heat 6-7 corn tortillas in the microwave until soft and pliable. Once all the enchiladas have been made, spread some additional cheese on top followed by any remaining sauce. Bake in a 350 degree oven for 20 minutes or until bubbly. Garnish with shredded lettuce and salsa. This recipe might seem like a lot of work – and it is. But I managed by making the cheese sauce and sour cream one day, and the enchiladas the next. I hope your family enjoys it as much as mine. 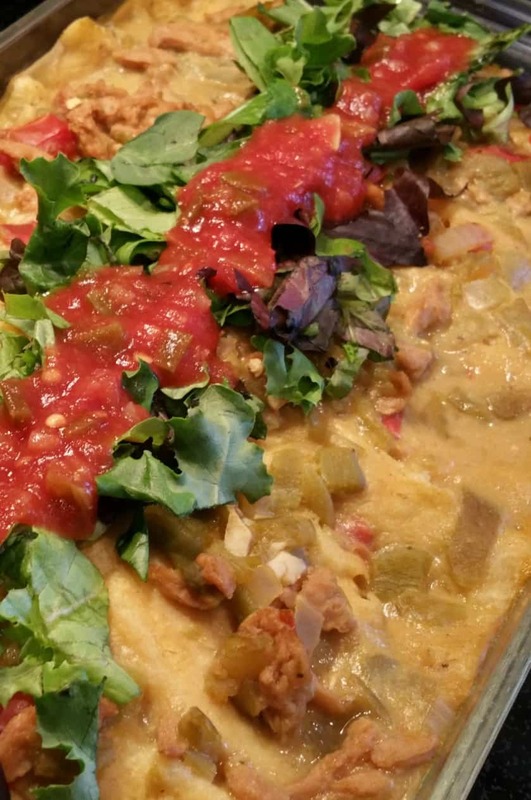 A New Mexico favorite - only Vegan! Green Chile Chicken Enchiladas with Soy Curls, Fresh Hatch Green Chile, Tofu Sour Cream and a creamy Potato Cheese Sauce. Spicy goodness! Place seam side down in casserole dish - repeat. I purchased some freshly roasted hatch chilies (hot) this week. Do i just purée them? This is my first time purchasing them. I can’t wait to try this recipe!!! You’ll need to remove the outer skin (the blackened part). I do this under running water. Then slice and remove the seeds and stem. Remember the membrane and seeds are what’s really hot, so be careful. Then just chop them up! Can this be made ahead and reheated? Or is it better to bake shortly before serving? I have a potluck this evening. Need to assemble early – will that work. I’m sure it will be fine made ahead of time. I personally like everything fresh right out of the oven, but it should be ok to reheat. Thanks for getting back to me. It’s all assembled now, I will slide it into the oven shortly before dinner is served this evening. Can’t wait! As I told the gang, if the whole is as good as all its parts, this will be a winner! This recipe was a winner last night! Delicious. You are so right! We New Mexicans love our chile! I am also a new vegan. Can’t wait to try this! Did try a bean and red chile one. Not bad. Hope I can find soy curls. It’s in the oven now. I put them together like I did my old recipe…added the sour cream to the broth, onions and green chilies (same ingredients…almost. I subbed arrowroot for flour) just different process. Put half that mixture down in the pan, put the cheese sauce and soy curls in the enchilada and covered with other half of sauce. I also ran a line of cheese down the center of the enchiladas just to make it pretty. It looks and smells really good! I may use cashew cream next time instead of the tofu…just prefer that flavor (I noticed in your last recipe that you do too). Thanks Chuck for the recipe! I have a pile of Hatch chiles and three brand new bags of soy curls on my kitchen counter. I was cruising Pinterest looking for inspiration when I found your post. Now I am not a vegan, I’m not even a vegetarian (although I was for many years) but I try to eat as many meat-free meals as I can to offset my otherwise carnivorous ways. My trip to Portland a few weeks back was a source of great inspiration to push the boundaries of my meat-free cooking. I am slowly learning that meatless does not equal sacrifice. Aaaand enchiladas are one of my absolute favorite comfort meals. Thanks for sharing! I can’t wait to make it myself! This is the BEST recipe! It tasted so much like a restaurant quality product and I knew everything in it was good- can’t get that from a restaurant. I took two days though, because I made the cheese and the sour cream the night before. I always keep these soy curls in my fridge, ready to rehydrate on demand. YUM!! This recipe will definitely be a main dish for our next Xmas holiday with the “omnivores”. I am not familiar with hatch chiles. What do they look like in the store? The can will say Hatch Green Chilies Generally with the other brands. Also can get the Tomato and green chilies in the Hatch brand. In the produce section it will have them identified as such in season. Which is Sept, Oct. 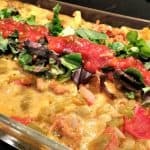 This is one of my favorite recipes, Sometimes I will tweak it a little by making it as a casserole instead by with the layering the tortillas, sour cream, cheese sauce, and filling.. 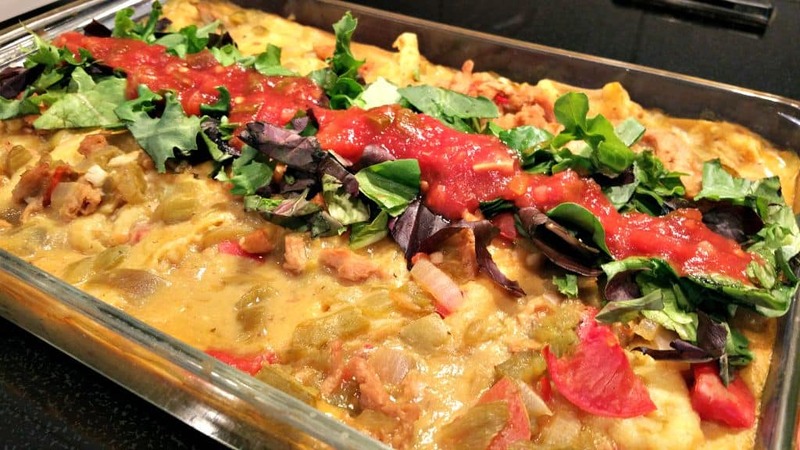 I remember for Christmas my grandma/ relatives would make green chile chicken enchiladas. I have been vegan for 2.5 years now and my mom is from New Mexico, so I decided to make these for my mom’s birthday and my whole (nonvegan) family loved them! At first I was a little skeptical how all the ingredients (sour cream, soy curls, and cheese sauce) would taste all together, but it turned out great!